Yesterday Disney outlined its plans for its Disney+ SVOD platform. Launching in November, the company expects to reach 60-90 million Disney+ subscribers by 2024, with the US contributing a third. Digital TV Research believes that this is achievable. In fact, Digital TV Research forecasts 75 million subscribers by 2024 – right in the middle of Disney’s estimates. 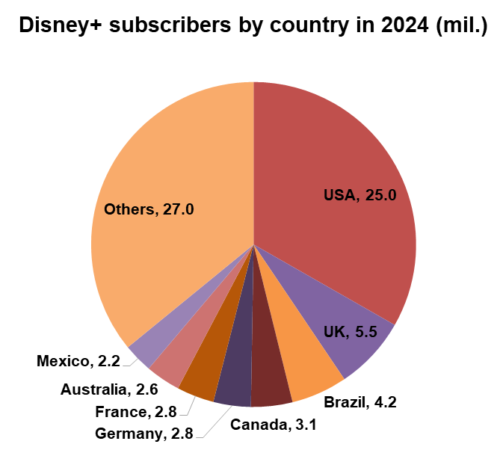 Digital TV Research forecasts 75 million subscribers for Disney+ by 2024, which is impressive growth in only five years. As a point of comparison, Netflix is forecast to have 200 million subscribers by 2024.